Tanya Tolchin grows vegetables and flowers on her family farm in Maryland just 20 miles from Washington, DC. She is a manager of Israeli Harvest, which supports Israeli farmers by selling their organic olive oil and dates in the US. She writes about farming, parenting and Jewish life on her blog and elsewhere. With everything so new following a big move from Maryland to Vermont, Tanya and her family are adjusting. But there’s one thing that hasn’t changed: the tomatoes that peek out in August. This recipe starts at your local farmers market. Arrive early for the best selection and buy every color tomato available and a few cucumbers. 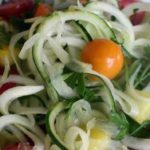 Of course, this salad can be chopped, but the spiralizer is lots of fun if you have one and works great with cucumbers. The last few weeks of school feel like a race to the finish line—and with so many emotions! Tanya is looking forward to resting—and making popsicles—with her children. On Lag b’Omer it’s customary to make a big bonfire and grill meat and potatoes. Although they won’t be ready for Lag b’Omer, Tanya and her family recently planted spuds on their farm. Just when it seemed that winter would never come, winter storm Jonas hit. On the farm, Tanya and her family played outside, enjoyed the quiet and then found a bit of green in the hoophouse. JFE® is going west! To celebrate the launch of JFE® in St. Louis, the Jewish Federation of St. Louis is hosting The Three Cs of Hosting: Class, Cooking and Cocktails on December 3. This is a new signature cocktail created by the bartenders at Artisan Well in St. Louis for the Jewish Federation of St. Louis’ “The Three Cs of Hosting: Class, Cooking and Cocktails,” the event launching the Jewish Food Experience® in St. Louis.